Belinda M Gordon, author of the hit fantasy novel Tressa’s Treasures, has today announced the reveal of the cover for her next installment in The King’s Jewel Series: Xander’s Folly. Blending Celtic mythology, suspense, and simmering romance, Xander’s Folly picks up not long from where Tressa’s Treasures left readers waiting: Tressa longs to accept Xander’s proposal of marriage, but as evil fae surface around every corner, she must choose between putting him in constant danger, or letting her soul mate go. Set in a world of spellbinding magic, mind-blowing twists, and exciting action at every turn, the reader will experience Gordon’s peerless ability to balance romance and tension on the edge of a sword, and will keep them engaged from cover to cover. Gordon enjoys writing from her home in the Pocono Mountains, with her wonderful husband, son, and two dogs. Those interested can learn more about Gordon and her work by visiting her website: http://www.belinda-gordon.com/. 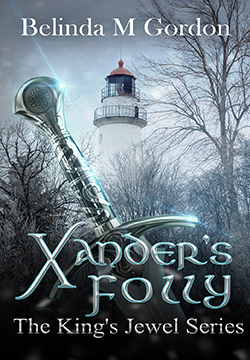 The cover for Xander’s Folly was designed by Wesley Goulart. You can find more of Goulart’s work HERE.